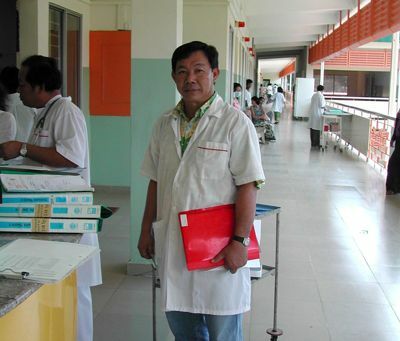 Choeut Sarouen, manager of the renovated Pulmonary Ward at Khmer-Soviet Friendship Hospital, the largest public hospital in Cambodia. The CHC has focused on creating a 'Center of Excellence for TB and HIV care' on this ward with support from the CIPRA and it serves as one of the 5 clinical sites of the CAMELIA. The CHC is performing a clinical trial in Cambodia to determine the best timing of TB and AIDS treatment for people who have both infections, which is still unknown despite the magnitude of the problem. The twin spread of tuberculosis and AIDS has created a human tragedy and a growing medical crisis for the developing world. People with AIDS have little or no immune defense against the widespread tuberculosis bacterium, which has become a leading cause of death in this group. The World Health Organization estimates that tuberculosis has killed up to half of the 30 million people who have died with AIDS globally. The CAMELIA trial is supported by a five year, $2.5 million dollar grant from the United States National Institutes of Health (NIH), through its Comprehensive International Program for Research on AIDS (CIPRA) and the French Agence Nationale de Recherches sur le Sida et les Hepatides Virales (ANRS). The study is being conducted in collaboration with the Cambodian National AIDS and TB Programs, and Medicins Sans Frontiers-Belgium. The study will involve a total of 660 patients who will be treated over the next three years. The results will have major impact on the treatment of TB and AIDS co-infection in Cambodia and in other impoverished regions of the world where the two diseases are epidemic. Given proper treatment, TB is curable even in individuals with AIDS. However, the optimal timing of introduction of AIDS drugs after TB therapy has begun is still unknown. The CAMbodian Early vs. Late Introduction of Antiretrovirals (CAMELIA) trial will test whether starting severely immunodeficient AIDS patients on antiretroviral medication (AIDS drugs) two weeks or two months after beginning their TB treatment results in better survival and fewer side effects. The CAMELIA represents a unique international collaboration between the US French and Cambodian clinicians and scientists. "The CHC views research as an integral component of its mission," says Dr Anne Goldfeld, a specialist in infectious disease at Harvard Medical School and the cofounder and president of the CHC. "At the same time as we are working to stop these terrible diseases, it is imperative to try to learn lessons that can be harnessed for future therapies. This clinical trial is one important step in that direction." The trial, which began in 2006, has as of the end of August 2008, already enrolled 520 patients in five sites, two in the in the capital city of Phnom Penh and one each in in rural Svay Rieng, Siem Riep and Takeo provinces. "The answer we will obtain from the CAMELIA study will inform international practice about how to time treatment of co-infection with TB and AIDS. It is a remarkable achievement that CHC, a local NGO, is able to lead this important trial in a country where a few years ago there was so little infrastructure and no experience with a trial of this magnitude," says Sok Thim, MD, executive director and co-founder of the CHC, and an investigator on the CAMELIA study. Sok Thim is also the Principal Investigator of CIPRA, whose overarching goal is to improve the treatment, research and teaching infrastructure for TB and HIV in Cambodia. With this funding, the CHC renovated the pulmonary ward of the Khmer Soviet Friendship Hospital, the largest public hospital in Phnom Penh. Formerly a dumping ground for destitute TB and AIDS patients who had no access to care, in two short years, the KSFH pulmonary ward has been transformed. The facility is now a Center of Excellence for TB and AIDS research and treatment, the first of its kind in Cambodia, and one of the clinical sites for the CAMELIA trial. The long-term investment in infrastructure development by CIPRA project will allow the sites to participate in evaluations of novel therapies and vaccines for both HIV and TB as they are developed in the future. But the major collateral benefit is the training of staff and the improvement in care that patients are receiving who are hospitalized on the ward.